No lawn watering between the hours of 9:00 AM to 5:00 PM. No holiday delays for watering. No lawn watering is permitted on other days of the week. Hand watering of lawn and landscape is permitted anytime. Due to the on going dry conditions, the summer Water Conservation Measures have been put in place. The summer Water Conservation Measures are needed to limit the daily demand on the water system in order to ensure that adequate water is available to meet the public health and safety needs of the Town. This measure is necessary to maintain the water levels in the tanks for fire protection and normal consumption. During the summer months, the Town experiences excessively high demands for water due to lawn watering. There have been 24-hour periods during which water consumption has been more than twice our average daily water usage for the year. 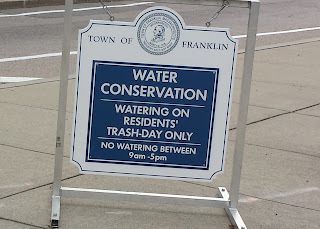 Because of the tremendous increase in the demand for water and State restrictions on the amount of water that can be pumped daily, the Town of Franklin must place mandatory water conservation measures in effect for lawn watering during the summer months. A total of 1-inch of water once per week from rain and watering promotes the healthiest lawns. Non-compliance with these regulations could adversely affect public health and safety. Violators are subject to fines up to $200. Private irrigation wells are not required to follow the water conservation measures, however, please remember that irrigation wells are taking water from the same aquifer as Franklin's drinking water wells, so please water wisely! If you receive a violation warning from the DPW, please call 508-520-4910 and let us know you have a private well. Did you know that the average American uses 100 gallons of water every day? But we can all reduce our water use by as much as 30 percent by taking a few simple steps, such as installing WaterSense labeled plumbing fixtures and using water efficiently in our yards. Did you know that the town of Franklin pumped over 990,000,000 gallons of water last year? 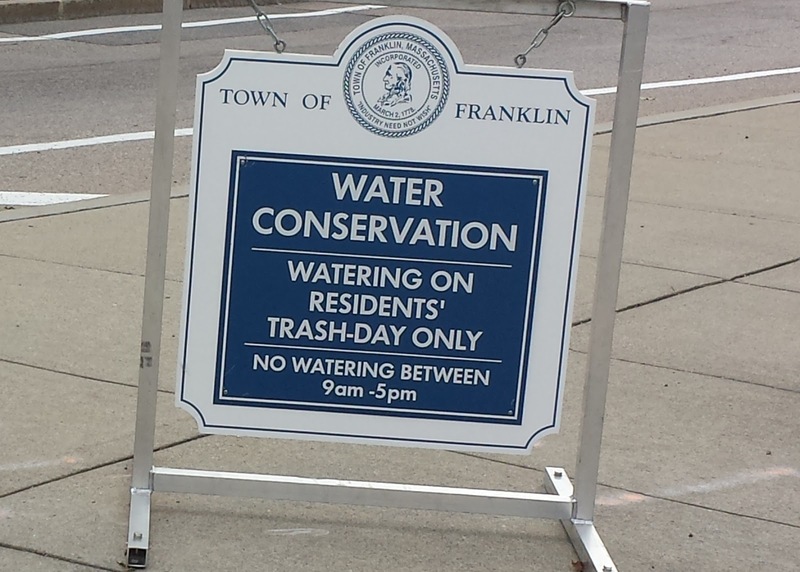 The Town of Franklin DPW is committed to protecting the future of our national and local water supply through water-efficient practices, products, and services. That is why we are partnering with the U.S. Environmental Protection Agency (EPA) to bring to you WaterSense, a national program that offers people a simple way to make product choices that use less water—and perform as well or better than your existing products. The Town is now offering rebates for installation of high efficiency clothes washers, toilets and rain barrels! Please click here for more information! Protecting and preserving the nations water supply is critical to our economic future and human health. Purchasing WaterSense labeled products can help you protect the environment and help you save money on your utility bill. According to the University of Massachusetts Cooperative Extension System, lawns require only one inch of water weekly either from rain or irrigation or a combination of both. Watering a lawn lightly on a frequent basis, rather than watering deeply once per week, encourages shallow rooting and crabgrass while making the lawn more susceptible to drought injury. The Town is now offering rebates for installation of rain barrels! Please click here for more information! Think you know everything there is to know about water? You can’t be sure until you’ve played EPA’s “Test Your WaterSense” online quiz! Maneuver the water-efficiency hero Hydro through water pipes and answer water-efficiency questions while avoiding water-wasting monsters such as Sogosaurus and Drainiac. Stay tuned as WaterSense labeled products become available at a store near you! EPA maintains an online directory of labeled products that can be found here. What is water efficiency? You can learn more about water efficiency and water saving tips for water consumers. Learn about the benefits of water efficiency and find links to related resources and state initiated programs.